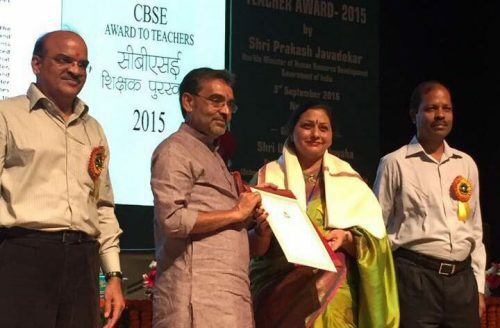 Chandigarh : Living up to the spirit of academic excellence, Mrs. Reema Dewan, Principal, Delhi Public School, Chandigarh has been honoured with the coveted National CBSE Teacher’s Award for her commendable contribution in the field of education for more than 30 years. The Hon’ble Minister of State, HRD, Shri Upendra Kushwaha presented the award to Mrs. Reema Dewan in a special award ceremony held in New Delhi. The award comprises of a Citation, Cash Award of Rs. 50000/- and a Shawl. Mrs. Reema Dewan will now attend the Teacher’s Day Function to be presided over by the Hon’ble President of India, Shri Pranab Mukherjee at Vigyan Bhawan, New Delhi on September 5, 2016. From the All Round Best Student in college who signed the Roll of Honour to a Gold Medalist in the university to a National Awardee as an educationist, Mrs. Reema Dewan in an achiever in the true sense. An accomplished educationist, Mrs. Reema Dewan has been associated with the Delhi Public School Society for over 26 years now. She joined DPS Noida in 1990 as PGT Economics and in a short span of time was promoted as HOD Economics and then given a dual charge with the post of Head Mistress, DPS Noida. In 2008, she was selected as Principal, DPS Chandigarh and has since then lead DPS Chandigarh to become one of the most sought after schools in the Tricity. She also holds the additional charge of DPS Mohali as Deputy Director. Mrs. Reema Dewan is an active Rotarian and her commitment to various social causes is definitely praiseworthy. In recognition of her contribution to the society in the field of education, Mrs. Reema Dewan was awarded with the State Honour by the Chandigarh Administration by the then Hon’ble Governor Shri Shivraj Patil on August 15, 2014.